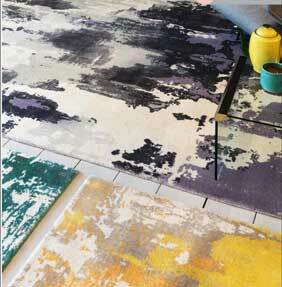 The Saturn rug range by Asiatic Carpets is designed to make a statement wherever it is placed in the home. The bold, abstract design of each rug has an almost paint-splattered effect which is highly contemporary and brings fun and character to wherever it is placed. There are five different colourways to choose from and each exudes the same boldness and vibrant character. Each Saturn rug features its bold pattern printed directly onto its luxurious wool pile. The rugs can be enjoyed in a choice of different sizes; with three rectangular options and an additional 200cm diameter circle option available.